An impromptu art performance showing off the creativeness and artistry of the performers – the art of Don ca tai tu’s music and songs in southern Vietnam – has earned an honor as a piece of the world’s intangible cultural heritage of humanity. UNESCO announced the decision to recognise the art as an intangible cultural heritage on December 5, during the on-going 8th session of the Intergovernmental Committee for the Safeguarding of the Intangible Cultural Heritage in Baku , Azerbaijan . Known as a musical art that has both scholarly and folk roots, Don ca tai tu (amateur singing) developed in southern Vietnam in the late 19th century. People in the south consider it an indispensable spiritual cultural activity and a highly valued part of their cultural heritage, which is performed at numerous events, such as festivals, ‘death anniversary’ rituals, and celebratory social events. The audience can join in, by practicing, making comments or creating new words for songs. The Cultural Heritage Department of the Ministry of Culture, Sports and Tourism said the music genre has met the criteria to be included on the Representative List of the Intangible Cultural Heritage of Humanity. It has been transmitted from generation to generation through official and unofficial forms of education in all 21 provinces, where the art form is popular. Don ca tai tu has continually been popularised through cultural exchanges among peoples, presenting their mutual harmony and respect. The art form is played on a variety of different instruments, including the kim (moon-shaped lute), co (two-stringed fiddle), tranh (16-string zither), ty ba (pear-shaped lute), song lang (percussion), bau (monochord) and sao (bamboo flute), and the violin and guitar, which were adapted. The musicians who contribute to Don ca tai tu include master instrumentalists, master lyricists, master singers, instrumentalists, and singers. In a document sent to UNESCO, the Cultural Heritage Department reported that from 1997 to the present, the government has provided funds for the inventorying, collection and documentation of the music genre and supported Don ca tai tu ensembles, clubs and families to organise the transmission of the art. “During our survey tour, we listed 21 provinces in the south of Vietnam that normally perform Don ca tai tu. 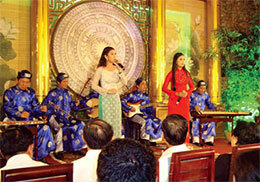 Among which, the Mekong Delta provinces of Long An and Bac Lieu reported the appearance of the music genre for hundreds of years,” said the director of Vietnam Institute of Musicology, Dr. Le Van Toan, as the inventory was completed. “It is an impromptu art performance to show off the creativeness and artistry of the performers. They use art to serve their daily lives, not to earn a livelihood. That’s why this music genre is much adored by the Southerners. “To meet UNESCO’s criteria, we worked with artisans and Don ca tai tu organisations to complete the localities possessing the music form. The inventory was completed with the scientific consultancy from leading experts, including Prof. Tran Van Khe,” Toan said. With this honour, Vietnam expects to increase respect for a valuable form of performance, encourage the community to recognise the value of cultural heritage, and to voluntarily take part in practising, developing, transmitting and safeguarding it. Further, it hopes to strengthen community cohesion and support the cultural identity of local people through musical exchanges. By confirming its international cultural value, Vietnam also expects to enhance international cultural cooperation and exchanges through transmission, dissemination, and education, as well as raise the awareness and responsibilities of communities, local authorities and the State concerning the research, documentation, practice, transmission and study of cultural heritages. Influenced by other forms of cultural heritage from the central and southern regions of Vietnam, such as nhac le (ceremonial music) and hat boi (classical theatre and folk song), the music genre was added to the National List of Intangible Cultural Heritage in 2012.